Mutations in the succinate dehydrogenase (SDH) complex (SDHx) lead to succinate accumulation, pseudohypoxic pathway upregulation, reactive oxygen species production, and ultimately oncogenesis. Although germline SDHx mutations are most frequently associated with pheochromocytoma and/or paraganglioma (PCC/PGL) formation, the tumorigenic potential of other tissues has become more readily appreciated. 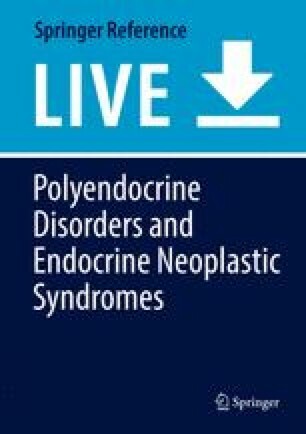 Recently the association of PCC/PGL and pituitary adenomas (the 3P association or 3PAs) was described in individuals with germline SDHx defects. Although rare, these adenomas seem to be more aggressive (commonly measuring greater than 1 cm in size), biochemically functional, and have unique features on histology. SDHx mutations are also associated with renal cell carcinoma, gastrointestinal stromal tumors, and papillary thyroid carcinoma, and thus 3PAs may be part of a multiple neoplasia syndrome due to SDH deficiency. In this chapter we review SDHx mutations and their associations with PCC/PGL, pituitary adenoma, and other tumors. This work is funded through the intramural program of the Eunice Kennedy Shriver National Institute of Child Health and Human Development (NICHD). Xekouki P, Brennand A, Whitelaw B, Pacak K, Stratakis CA. The 3PAs: an update on the association of pheochromocytomas, paragangliomas, and pituitary tumors. Horm Metab Res. 2018; https://doi.org/10.1055/a-0661-0341. [Epub ahead of print].